Hiring maintained momentum in July, with U.S. employers displaying a considerable measure of resilience amid a challenging and shifting global scene. Last month’s continuation of the strong hiring trends recorded in the preceding quarter occurred amid higher risk stemming from tensions in the Middle East and Ukraine, and weakening global equity markets. However, several economic indicators, including a strong initial reading of second quarter GDP, point to a U.S. economy that continues to generate new business opportunities for U.S. companies. Accordingly, hiring will remain steady over the near term barring an unanticipated shock to the economy. Private-sector employers added 198,000 positions in July, combining with rising government payrolls to yield a total gain of 209,000 workers for the month. All 10 private-employment sectors created jobs last month, led by a sizable increase in professional and business services payrolls. This sector includes a wide range of office-using positions, temporary employment and building maintenance. Elsewhere, ongoing apartment construction and a modest level of single-family development contributed to a gain of 22,000 construction jobs in July. Nevertheless, subdued building in other commercial property sectors leaves construction payrolls nearly 1.7 million positions short of the previous peak. 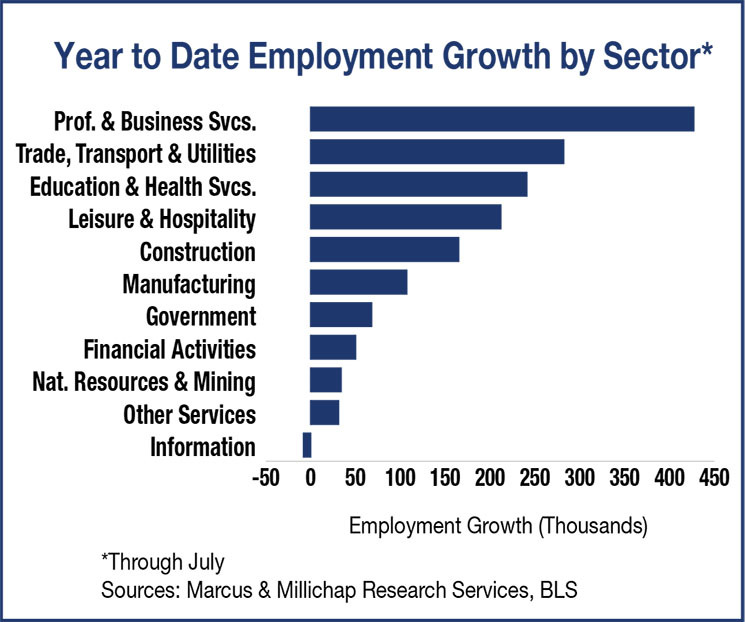 Other leading sectors include trade, transportation and utilities, which added 39,000 workers in July, primarily at retail outlets, while expanding medical practices contributed to growth in education and health services staffing. The Federal Reserve announced its intention to continue its tightening of monthly bond purchases to $25 billion this month, citing labor market slack as justification for maintaining its accommodative monetary policy. In the near term, the central bank will closely monitor the labor force participation rate and the underemployment rate, which has been stuck in the low-12 percent range for the past four months. Sustainable improvements in both measures would indicate the economy is running closer to full potential and provide justification for the Fed to modestly tighten its highly accommodative positioning. Increased merchandise inventory passing through warehouses and distribution buildings supported additional hiring for warehouse positions. Year to date, more than 19,000 posts were created, far outpacing the less than 3,000 jobs added in the corresponding period last year. The need to expand staffing underlines the improving operations and near-term prospects for the industrial property sector. Construction of new space is muted, and growing space demand will reduce the national industrial-property vacancy rate 100 basis points in 2014 to 7.1 percent. Growth in employment sectors with significant office-using functions, including professional and business services, and financial activities, is driving a broad-based improvement in operations in the U.S. office sector. Tenant expansions drove the national vacancy rate 30 basis points lower to 15.6 percent in the first two quarters of 2014. Continued employment growth will encourage businesses to expand footprints, boosting space demand through the remainder of the year while construction remains limited in most markets. As a result, the national office vacancy will tighten further to 15.3 percent by year end. This entry was written by marcusmillichap, posted on August 4, 2014 at 11:52 pm, filed under Research and tagged Commercial Real Estate, Employment. Bookmark the permalink. Follow any comments here with the RSS feed for this post. Post a comment or leave a trackback: Trackback URL.